How much carbs and how much protein per day, these are two questions you will always want to find answers. And you may hear many different ideas, concepts and theories around these questions which could leave you wondering as well. Let’s be realistic, think about ancients days, thousands of years ago how humans lived, was there something called exercise? Was there a problem called obesity? Was there patterns of dieting like Keto, Paleo, Atkins etc. 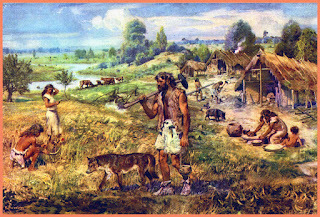 History confirms that sedentary lifestyle was first observed during the days of agriculture revolution, yes I am talking about the first agriculture revolution, the transition from hunting and gathering to planting and sustaining. This thought always fascinates me. This thought makes me think and ask more questions to myself about the days before the initial agriculture revolution. Wouldn’t they miss meals while they are hunting for food? Did they take proteins for recovery after loads of activity they do to maintain life? It is clear that exercise is a product that came to existence due to civilization when humans gave up on hunting and started planting and sustaining. We as human started to lack movement, started to adapt a lifestyle which eventually turned us in to couch potatoes. It is also clear that eating processed food and eating meat in large volumes came to human lifestyle as part of civilization. Imagine the days of hunting, would one be able to eat a portion meat or diary on every meal. For obvious reasons eating meats can be called celebration to mark success of hunting? All these facts, questions and its answers makes life very simple for someone who loves start a better lifestyle. Take things simple, make exercise and eating habits simple. There is no harm for you to miss a meal, there is no harm to miss a breakfast, there is no harm for you to train empty stomach. In fact these can be beneficial to build you as a stronger and better human. The best food comes from plants. The raw format of these vegetables, fruits and nuts are the most nutritious and best food to consume on a regular basis. Eating meat; be it beef, lamb, chicken or any other should be occasional. Fast occasionally by skipping a meal or if you want to hear on a modern trendy terminology “intermittent fasting”. And coming to exercise, do it to become stronger as a human, to build stamina both physically and mentally. Don’t get caught up in the single activity plan which you think or some concept said is the best fix for everything. Play a game, go run, swim, climb a tree, climb some stairs or maybe crawl on the beach. Whatever you do make sure you love it and that’s when you can call it exercise.